This movie caught my attention few months ago when there was some article referring to the many movies starring Dwayne Johnson aka The Rock. There was no plot detail about the movie back then, but after I saw the trailer not long ago, I realized that it looked like a full action movie and should be interesting to see. My wife and I chose to see this one at Epicentrum to enjoy the large screen it had, which I thought would be nicer to experience the action sequences related to the film. Well here are more detail of the film. Will Sawyer (Dwayne Johnson - Rampage, Moana etc) was a former FBI agent who had built a small security firm and was being asked by his ex colleague Ben (Pablo Schreiber - Den of Thieves, The King's Daughter etc) to perform a small audit on the tallest building in Hong Kong (and the world) called the Pearl, owned by a wealthy businessman Zhao Long Ji (Chin Han - Ghost in the Shell, Contagion etc). During the meeting with Zhao at the Pearl, Will also brought along his wife Sarah (Neve Campbell - Scream quadrology, Wild Things etc) and their twins children Georgia (McKenna Roberts) & Henry (Noah Cottrell) to stay at the 98th floor of the building. Meanwhile, a group of criminals led by Botha (Roland Møller - Atomic Blonde, The Commuter etc) were planning to do something with the building, which involved setting the building on fire. The Hong Kong police led by Inspector Wu (Byron Mann - The Big Short, The Man with the Iron Fists etc) would later on be involved in stopping the criminals. So could Will save his family from the tall building on fire, especially with his physical condition? And what was the reason for Botha to set it on fire in the first place? Find them all in this fun, exciting & full of action movie. This movie was awesome in term of the suspense we were getting from the action and the cool special effects which it truly delivered. My wife and I were truly enjoying this movie for all those factors. 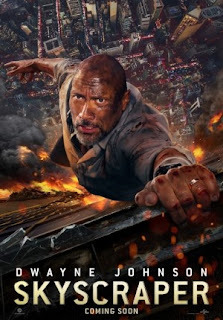 Sometimes we were also feeling amazed and absorbed in the suspenseful scenes, especially that incredible jump scene or Dwayne Johnson's fight scenes. The film itself started of brightly, then there would be the introduction of Sawyer family, plus the showing of the smart building and tallest skyscraper which I think done pretty nicely by the special effects team. Then it continued to be quite non stop action till the end. Movie such as this would rely heavily on computer effects. And luckily with a hefty budget of USD 125 million, personally I was satisfied with the effects. The computer graphics were quite smooth and the building plus the fire on it were quite lifelike. The actions were top notch and I think Dwayne Johnson literally rocks. I think his name nowadays can be translated into guaranteed good action movie (and of course some commercial success). Although some of the action sequence were a little bit exaggerated but mostly they successfully fulfilled my need of a good old fashion action scenes. I think other characters were OK but the main attraction certainly would be him. The movie's plot here was not too complicated (which was not the main attraction anyway). In fact I felt a bit similarity with the first Die Hard movie starring Bruce Willis. It is probably a combination with a movie about tall building on fire such as The Towering Inferno. But people should not expect this to be a smart intelligent movie without any plot holes. Audience who expect that kind of film would probably be disappointed since this film should be enjoyed as pure fun and excitement. Credit should be given to the director Rawson Marshall Turber who previously directed action comedy or comedy movies such as Central Intelligence, We're the Millers and few others. Sound effects of the film was great. I was not sure whether it was real Dolby Atmos effects or not (since the cinema website did not put such effect), but I was satisfied. The fire sound or the fighting scenes sound were very good. And again, I cannot iterate enough about the special effects of building on fire and the scenes from high altitude that were amazing. As my wife and I were not fans of height, this film also brought the intense feeling as well. The duration was around 1 hour 41 minutes including the very long credit scene to appreciate those effects team. Oh there was no post or mid credit scenes to be seen in here. Since the movie was categorized as PG-13, it was quite safe to be seen by teenagers, but I do not think it was suitable for the young children, as there were few violent scenes and very brief strong language. There were also few cheesy moments and a bit touching scene which as usual affected my wife. Now if you are looking for a pop corn movie that would provide you the enjoyment of silly fun or the suspense and Dwayne Johnson in action, then this movie should be able to satisfy you. But if you are looking for a smart movie and expect the best kind of scenarios/plots full of logics, then you probably would not like this one. My wife and I were certainly part of the former audience. The choice is yours.